The story of Angulimala stands as one of the great sutras on Compassion. 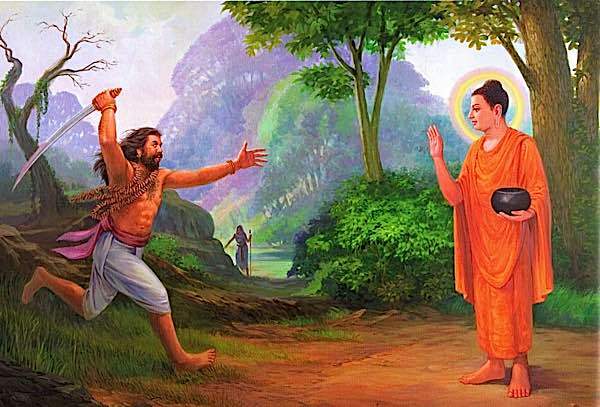 Shakyamuni Buddha, alone and unarmed, sets out to single-handedly stop a mass murderer from killing his own mother — just to add a 1000th “severed finger” in his murder necklace. 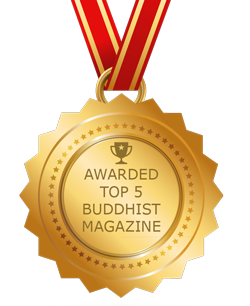 Although the sutra is generally regarded as a teaching on karma — especially the concept that no matter how bad your karma is, you can still obtain Enlightenment — I’ve always taken it also as a glorious example of Buddha’s vast ocean of Compassion. Buddha was warned: “He has destroyed complete villages, complete hamlets and even states. He kills humans to wear a garland of fingers. O recluse, even a band of ten, twenty, thirty forty, or even fifty people going along this path were killed by this robber Angulimala. When this was said the Blessed One went on, silently.” Buddha would not be DETERRED from saving this killer. True, the Buddha was never in danger. And, a Buddha knows no fear. But, Buddha saw in this mass murderer the Buddha Nature that is in all of us, no matter how wicked. Buddha saw that this man was about to commit the horrendous crime of matricide. His compassion was limitless. 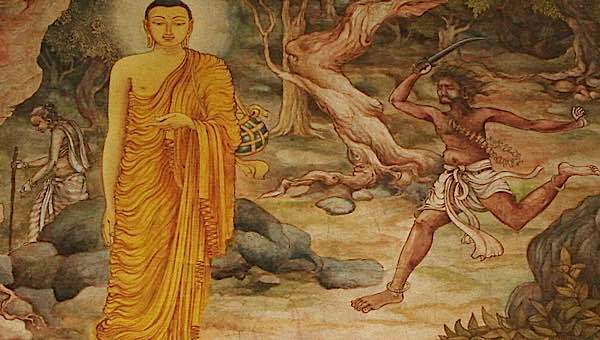 Angulimala tries to kill Buddha. Buddhist Enlightenment isn’t always a free ticket to peace. Once Enlightened, great beings still have to extinguish karma. Tibet’s Milarepa and the Arahat Angulimala stand as historical witnesses of the consequences of karma — even for the Enlightened. [Angulimala Sutta in full below, with the great story of Angulimala’s conversion from mass murderer to Arahat.] 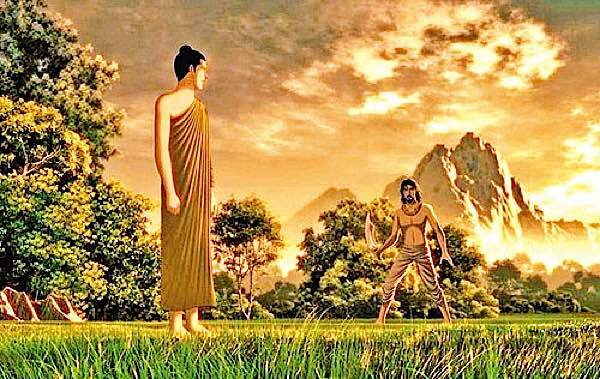 Both the great Enlightened Milarepa and the great Arahat Angulimala were mass murderers — Milarepa for revenge, Angulimala for sport. Imagine a mass murderer, a man who boasted of killing 999 people, about to contemplate the murder of his own mother, with the even more intense karma of Matricide. At one time the Blessed One was living in the monastery offered by Anathapindika in Jeta’s grove in Savatthi. At that time in King Pasenadi Kosala’s kingdom there was a robber named Angulimala. He was fierce, with bloody hands, engaged in killing living things without mercy. At that time he destroyed complete villages, complete hamlets and even the state. He killed humans to wear a garland of fingers. Then the Blessed One put on robes in the morning, taking bowl and robes entered Savatthi for alms. Going the alms round and returning from the alms round and after the meal was over, arranged the dwelling and taking bowl and robes, followed up the path to where Angulimala was. Cowherds, farmers and travelers seeing the Blessed One following up the path leading to where Angulimala was staying said. ‘Recluse do not fall to that path, there lives a robber named Angulimala, a fierce one with bloody hands, engaged in killing living things, without mercy. He has destroyed complete villages, complete hamlets and even states. He kills humans to wear a garland of fingers. O recluse, even a band of ten, twenty, thirty forty, or even fifty people going along this path were killed by this robber Angulimala. When this was said the Blessed One went on, silently. 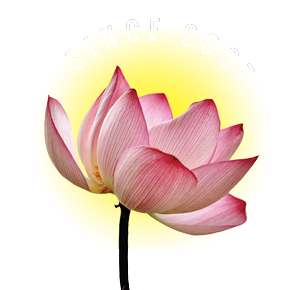 Angulimala, I have stopped. ‘Stop you too!’ The Blessed One said. Then it occurred to the robber Angulimala: These recluses, the sons of the Sakyas talk the truth and are established in the truth: Yet while walking why did he say, I have stopped and Angulimala you too stop! What if I ask about it from the recluse?’ Then the robber Angulimala said this verse to the Blessed One. ‘While going the recluse says ‘I have stopped,’ when I have stopped, he says I have not stopped. Angulimala I have stopped for good, giving up punishing living things. I will throw away demerit for good, hearing your words enjoined with the Teaching. Then and there the robber threw away his weapons into the depths of the forest, fell at the feet of the Blessed One and begged for the going forth. Then the Blessed One with venerable Angulimala as the second monk went through the streets of Savatthi and arrived at the monastery offered by Anathapindika in Jeta’s grove. At that time at the entrance to the palace of king Pasenadi of Kosala was assembled a large gathering, making much noise: Lord, there is a robber Angulimala, in the kingdom. He is fierce, with bloody hands, has no compassion for living things, destroys, hamlets, villages and states. He killing humans collects fingers to wear as a garland round his neck. Lord he should be punished. At that time venerable Angulimala was seated close to the Blessed One, and the Blessed One stretched his right and said, to king Pasenadi of Kosala: Great king that is Angulimala. Then venerable Angulimala agreed went to Savatthi approached that woman and told her. ‘Sister, since I was born in the noble birth I have not destroyed a living thing knowingly, by that truth may you be well and may the one to be born be well.’ Then she got well and the child was also well. Then Angulimala withdrawn from the crowd, secluded and diligent for dispelling abode and before long for whatever reason sons of clansmen rightfully leave the household and become homeless, that noble end of the holy life he here and now knowing realized and abode. He knew, birth is destroyed, the holy life is lived, what should be done is done. There is nothing more to wish. Then venerable Angulimala putting on robes in the morning and taking bowl and robes went the alms round in Savatthi. Then if a clod was thrown at anybody else, it hit venerable Angulimala. If a stick was thrown at anybody else, it hit venerable Angulimala. If a stone was thrown, it hit venerable Angulimala. Venerable Angulimala would come to the Blessed One with a split head and blood dripping, with the bowl broken and with robes torn. 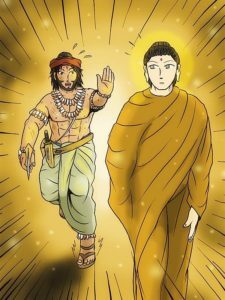 The Blessed One seeing venerable Angulimala approaching in the distance would say: Brahmin, endure that, on account of the results of your actions you would have been reaping results for many years, for many hundreds of years, for many thousands of years in hell. Brahmin, bear the results of your actions here and now. ‘The negligent one became diligent, and illuminates the world like the moon freed from clouds. When his merit covers up the demerit, he illuminates the world like the moon freed from clouds. The young Bhikkhu yoked to the Dispensation of the Blessed One illuminates the world-like the moon freed from clouds. My enemies, listen to the Teaching, be yoked to the Dispensation of the Blessed One. Do not hurt me or anybody else for any reason, attain to the highest appeasement and protect the firm and the infirm. Irrigators lead water, fletchers bend arrows, the carpenter bends wood and the wise tame the self. Some are tamed with a stick, or hook or whip, I was tamed without a stick or weapon, by a such like one. Earlier when I was a hurter, my name was non-hurter, now am true to my name I do not hurt anyone. Earlier I was a robber known as Angulimala, and was carried away by the surge of the refuge in the enlightenment. Having done many actions leading to birth in hell, touched by the results of actions I partake food without a debt. 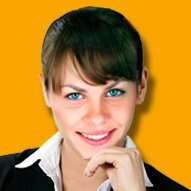 Fools are yoked to negligence; the wise protect diligence as the highest wealth. Do not be yoked to negligence, and sensual pleasures, concentrate diligently to attain pleasantness. Go to increase, not to decrease, this is good advice, reach the highest of the analytical knowledge’s. Go to increase, not to decrease, this is good advice of mine, I have attained the Three knowledge’s and done the dispensation of the Enlightened One.